Have a deeper sense of purpose, and a fire in your core, that drives you toward living your best possible life, and becoming the person you were meant to be, creating real, lasting change in your life. Get ready for a life of abundant health, wealth, love, and joy! Are you feeling anxious, overwhelmed, and out of balance? Does your head begin to pound when you think about your money, your health, or your relationships? Are you hiding behind a busy schedule? Exhausted taking care of everybody else? Sick and tired of being sick and tired? Have you invested in programs before and been disappointed, still wanting a solution? If you said yes to any of these questions, you are not alone. The change will be in you! Are you looking for more peace, joy, and a different life, and have tried lots of healing approaches but still feel stuck, weighed down by inner doubt and the pain of the past, unable to create your dreams? This method is a more effective approach to healing the past AND beyond, with specific work to MOVE you into your power, in a real way, so you can achieve your dreams. "I just need to THINK BIG AND BELIEVE." Do you just know you are meant to do something bigger? And, you have tried lots of techniques and mindsets to think positively, and avoid negativity. But you still feel stuck in your life, unable to focus and take action to create your dreams. And money is a painful problem. Mindset is only one piece. You need to heal the sources of what keeps you stuck AND step fully into your most powerful, joyful, inspired self, to accomplish your dreams. "I just need to OWN MY POWER AND STOP DOUBTING MYSELF." Do you feel you were meant for something bigger, and have tried lots of inner work, programs, therapy, and had many achievements, but you can feel how your inner doubt stops and sabotages you, and you can't find a solution? More workshops, learning, and achievements will not address lifelong inner sources of doubt. You need deeper work, and REAL results, to shine in your true power with confidence for your bigger calling. "I just need THE RIGHT STRATEGY." You really want to make your big dream happen and you've tried lots of coaching for accountability and marketing techniques. But you never implement fully, and can't figure out why. The focus and action you need can't come from your head or a strategy. You need the grounded energy of being in your power, with passion, enthusiasm, and leadership energy, to achieve your big goals. Tap into your power! Be guided through a safe and strategic, step-by-step process where you will see, often for the first time, the internal and external blind spots that have impeded your progress. Tap into your brilliance! Learn what's really happening in your brain that keeps you mired in old patterns that sabotage your ability to earn more income, be healthy and fit, and have meaningful relationships. Tap into emotional fitness! Uncover, heal and clear the stuff that's buried deep inside you, like the unconscious beliefs that trigger emotions, and feelings of fear and anxiety, self-doubt, procrastination and resistance, anger and resentment, or overwhelm and unworthiness. Tap into your power source! 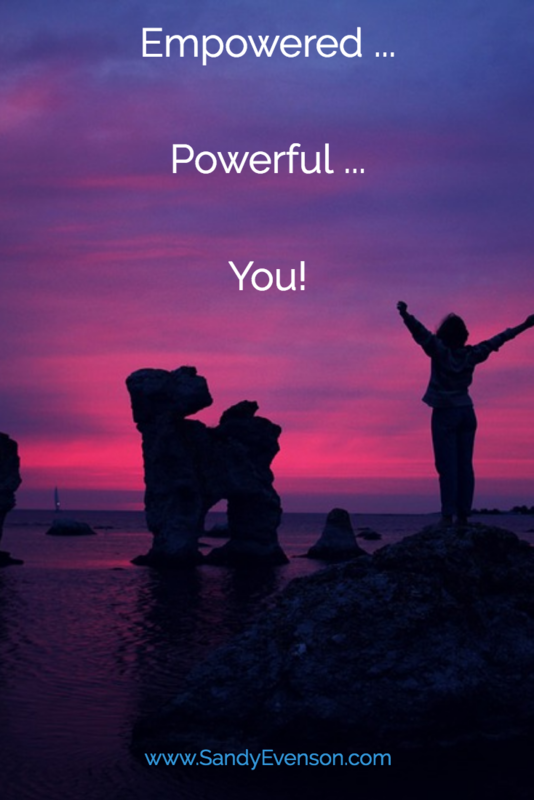 Discover the unlimited strength, power, and energy within you, that fuels you to stay on track, get into action, reach your goals, and fulfill your dreams. Learn EFT/Tapping, the clinically proven, powerful, mind-body tool, to buffer down your stress, manage physical and emotional pain, supercharge your income, and improve your experience around money, curb cravings, ramp up your self-confidence, and maximize your energy! Show up, speak up, and act more powerfully, in your own unique way. Book your FREE Discovery Phone Session with Sandy today. Book your incredible discovery session now. Here's what we'll do together in this valuable session: We'll get really clear on your goals, and diagnose the obstacles that are stopping you right now. I promise to give you my best recommendation for strategy, and the next steps you should take, so you can have the life you desire, and the life you deserve.